Design the perfect front entry to compliment your homes architecture. Eliminate Bugs, Insects and other Pests! Keep reptiles and other pests outside where they belong. No more landscape debris & no more sweeping those wasp nests off walls. Enjoy those Florida breezes, increase your health. A safe way to meet strangers & an elegant way to greet family and friends. Add Curb Appeal, Accentuate Your Home's Front Entry Doors & Architecture with a Decorative Screened Entry. Whether you have an older style home with a front porch style entry or a newer home with large vestibule type front entry, our front entry screen enclosures can be customized to fit your home's unique architecture. With over 60 screen door styles, you can choose single entry or double entry door styles. 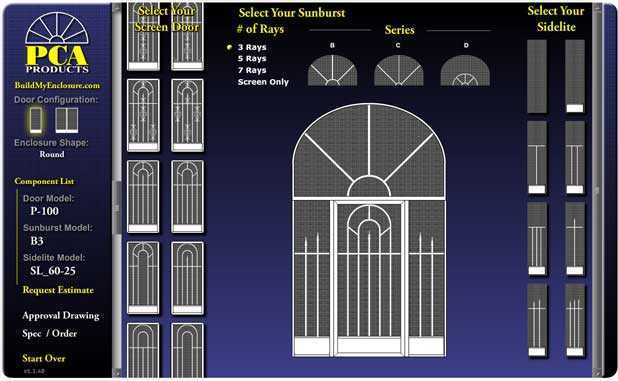 Also choose from our wide selection of sidelights and sunbursts to accent your home's architecture and add curb appeal. Our products are powder coated by hand for maximum protection in salt air environments. With 5 colors to choose from, we are sure to have a combination to match your distinct style. Are you wondering how to keep bugs out of the house? We have the answer! A PCA decorative screen entry protects your home's front vestibule day and night. In Florida, bugs are a year round problem. Installing a bug screen entry on your home is a practical way to enjoy the beautiful weather while keeping the bugs out. During the day, you may have lizards, house flies, mosquitos, wasps, hornets and other similar insects making their way into your home. By night there are the moths, beetles and other nighttime pests drawn to your front entry lighting. Geckos might also be a problem because they feed off the insects attracted to your lighting. With a custom screen front entry, you will be able to open your front door on beautiful days, let the breeze in, and not worry about insects invading your home. Another benefit of having a custom screen front entry is that it keeps dirt and debris out of your home. In Florida, lawn care days are often a messy situation. Grass cuttings blown from your walkway often pile up in an unprotected front entry and are tracked into your home. Here again, with a screened entry this will be kept to a minimum. Create the perfect front entry online Today! With our online front entry design tool, we make the design process easy. Start by selecting the shape that best matches your homes architecture. Then choose a door, side lights and the sunburst above the transom. Mix and match until you find the perfect combination for your home. Go ahead and click, have fun, let your imagination run wild. Create the perfect front entry to accentuate your home's architecture. Don’t settle for the inferior quality and limited selection of other Screen Door Manufacturers. Demand a screen door that is designed to last is salt air environments! 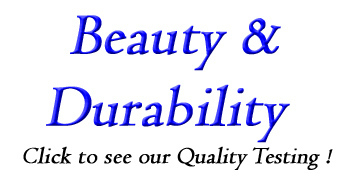 The Aluminum Screen Door Supplier Tallahassee Fl and the surrounding areas. Let PCA Screen Door Company supply you with the heavy duty screen doors you have been looking for. Start enjoying the beautiful Florida breeze, open up your front entry doors, and stay bug free!